Lab palaeo-artist extraordinare Danielle Dufault has recently made us an amazing logo. It’s basically a coat-of-arms for the ROM/University of Toronto vertebrate palaeontology research group, with our ambassador Parasaurolophus walkeri taking pride of place in the center, flanked by the sabre-cat Smilodon, the ankylosaur Zuul crurivastator, and Acheroraptor temertyorum in the foreground. Thanks Danielle for the awesome artwork- it looks great on our new T-shirts and caps! This week, lab postdoc Victoria Arbour and I unveiled a new species of armored dinosaur, Zuul crurivastator, based on an almost complete and remarkably well-preserved skeleton from the Judith River Formation of Montana. The research describing the new skeleton, identifying Zuul as a new species, and placing it in the family tree of armored dinosaurs was published in the journal Royal Society Open Science (http://rsos.royalsocietypublishing.org/content/4/5/161086) and is open access. The new paper was led by Victoria, a globally recognized expert on ankylosaurs, who recently joined the ROM Palaeo team on an NSERC postdoctal fellowship. It was a fantastic experience working with Victoria on the paper – who also deserves big credit for coming up with the awesome name for our new dino. I learned a lot about ankylosaurs from her during this project. We have both really enjoyed working with our amazing palaeo-artist Danielle Dufault, who created the vivid life reconstructions of Zuul for the website, well as the whole behinds-the-scenes Zuul team. This paper marks the beginning of a larger scientific project on this amazing skeleton and its associated fossils. The name Zuul is based on similarities between the beautifully preserved skull of our fossil and the terror-dog monster from the 1984 blockbuster film Ghostbusters – both have a broad, rounded snout, gnarly forehead, and two sets of horns behind the eyes. The species name, crurivastator, translates to “Destroyer of Shins”, in reference to its menacing tail, which ends in a massive club-which may have been used to defend itself from predatory dinosaurs or compete with other members of its species. The research announced today is just the first phase of a larger project focusing on Zuul and its world. The soft tissues are particularly exciting, and we will be conducting research testing for the preservation of biomolecules. In addition, the 75 million year old river channel deposit that produced Zuul’s skeleton also produced a wide range of well-preserved fossils of other plants and animals living alongside Zuul. These fossils include complete turtles, a crocodile, bones of duck-billed dinosaurs, ostrich dinosaurs, and horned dinosaurs, plus plants, clams, snails and more. We are also conducting research reconstructing Zuul’s palaeoenvironment with geologist Federico Fanti (University of Bologna, Italy), as well as precisely dating the age of the fossil deposit based on volcanic ash deposits with colleagues from the University of Toronto. The rock strata where Zuul was collected are also extensively exposed in southern Alberta, about 50 km to the north, where they are called the Oldman Formation. These rocks have been the focus of a long-term collaborative ROM field project (with Dr. Michael Ryan, CMNH), the Southern Alberta Dinosaur Project, where we have systematically collected thousands of specimens with carefully recorded temporal and environmental context. We can therefore place Zuul and its associated fossils precisely within this framework. In fact, our team is currently digging up a tyrannosaur and a duckbilled dinosaur from the same stream channel complex expressed in Alberta. Within this bigger scientific dataset, Zuul contributes to a much larger understanding of how dinosaur diversity and evolution are related to environmental changes leading up the end-Cretaceous extinction event, which occurred less than 10 million years after Zuul lived. The Royal Ontario Museum is very excited about Zuul, and there is much more to come, so stay tuned. Today, my research group published a new paper in the journal Current Biology addressing one of the biggest mysteries of the end Cretaceous mass extinction event- why the did the ancestors of living birds survive, but contemporary small, feathered raptor dinosaurs and primitive toothed birds go extinct? Our research provocatively suggests that at least some groups of living birds may have their ancestors’ beaks to thank for surviving the asteroid impact and resulting mass extinction that wiped out the dinosaurs. We show the closest relatives of modern birds, the small feathered raptor dinosaurs and primitive toothed birds, went extinct abruptly at the end of the Cretaceous Period, and that beaked birds may have benefited because of their ability to eat seeds. The study was led by University of Toronto PhD student Derek Larson (now at the Philip J. Currie Museum) and included Dr. Caleb Brown, who graduated a couple of years ago and is now at the Royal Tyrrell Museum– the study took almost five years to complete. Several recent studies have suggested that large herbivorous dinosaurs were decreasing in diversity in the last few million years leading up to the end Cretaceous extinction event. We were interested in seeing if small, feathered dinosaurs and early birds followed this pattern. But their fossil record is extremely fragmentary in the last 20 million years of the Age of Dinosaurs. Therefore, it is difficult to quantify just how many species there were at any given time and how that changed. The only consistent and informative fossil indicator of their diversity is their teeth- which are abundantly preserved in microfossil bone beds. Interestingly, tooth shape is a key indicator of diet, so we reframed the question from how diverse they were in terms of species, to one that traced the breadth of feeding niches they occupied in the time leading up the extinction event. This would actually provide us with even more information because we could look at the ecology of their extinction. So we analyzed more than 3,000 of these teeth to give the highest resolution picture of their changing shape and diets over the last 20 million years of the Age of Dinosaurs. The teeth of these bird-like dinosaurs and primitive toothed birds to show that these dinosaurs were a consistent and stable part of the ecosystem leading up to the end of the Cretaceous. There was no evidence of a long term decline- they went extinct very suddenly in geological terms. Preserved bird and bird-like dinosaur teeth examined in this study were likely suited to eat a variety of animals- insects and small vertebrates. However, modern birds (Neornithes) are characterized by the shared presence of a toothless beak-so we hypothesized that diet might have been a key factor in their survival. And if the feathered bird-like dinosaurs that ate animals went extinct, perhaps birds survived because they could eat plants, or more specifically, seeds. In the conditions in the wake of the asteroid impact, global forest fires raged and the sun was blocked out by debris ejected into the atmosphere. The ecosystem would quickly lose foliage and animal life. The tooth maniraptoran and early birds were tied to photosynthetic food webs, and my have been more likely to perish. But seeds would be high-energy packets of food that would persist on the landscape, and any animal that could access them would have an ecological advantage. IF the ancestors of at least some groups of modern birds could access this resource in the critical time period immediately after the impact, that could have been vital. The bird fossil record at the end of the Cretaceous is very incomplete, so the ecologies of species that survived the mass extinction are still largely unknown. With little direct evidence of fossil species surviving the extinction, the reasons as to why some species were able to survive the extinction while their closest relatives went extinct have been unclear. So we looked to living birds to see if we could test our idea. First, we used the latest family tree of living birds to see if seed-eating was the primitive diet of the early ancestors of living birds. The data clearly infer that the earliest branches of the bird family tree were likely seed eaters that preferred terrestrial habitats, and were unlikely to be waterbirds- as has been previously suggested. So these groups would have been around when the asteroid hit, and could have benefited from eating seeds during this global crisis. We then looked to present day ecological studies to see what bird flourish in disturbed habitats. Interestingly, it turns out that seed-eating birds are very typically the first vertebrates back into disturbed habitats ravaged by forest fires. This makes sense, because a forest fire will burn all the foliage and decimate the animal population, but seeds can survive in their protective shell, and they can lie dormant for decades, providing food for seed-eating birds. Its important to keep in mind that extinction patterns at the end of the Cretaceous are complex and involved multiple factors, and we are not proposing that the only reason crown birds survived was seeds. Body size, sensory and metabolic differences, and other factors may have also contributed, and conditions would have affected different bird lineages differently. But small teeth have given us big insights into the extinction patterns of bird-like dinosaurs and primitive birds, and a better understanding of how diet might have played a role in the survival of crown-group bird groups in the wake of the asteroid impact. Derek on Quirks & Quarks here. Today, Michael Ryan and I published a paper describing a new species of horned dinosaur, Wendiceratops pinhornesis. 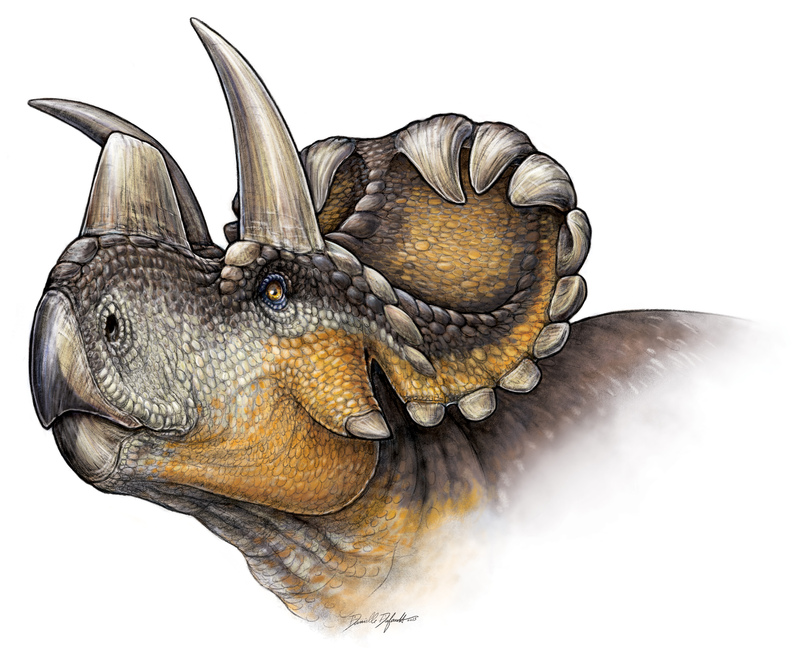 It is one of the oldest known members of Ceratopsidae, the family of large-bodied horned dinosaurs that includes Triceratops, and it provides new information on the early evolution of skull ornamentation in this iconic group of dinosaurs characterized by their horned faces. The quarry in southern Alberta where Wendiceratops was excavated. The bonebed that produced all of the known Wendiceratops fossils is located in southern Alberta, and in rocks of the lowest part of the Oldman Formation that date to approximately 79 million years. The site was discovered in 2010 by Wendy Sloboda, when she was prospecting for new fossil sites as part of our field team. She found numerous bones, including parts of the distinctive frill, coming out of a mud rock layer at the bottom of a very steep hill. 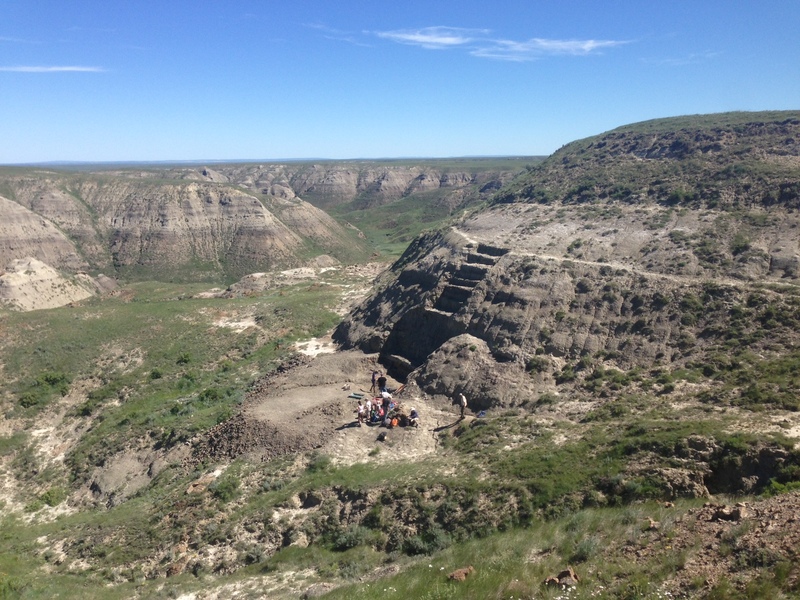 In order to uncover more bones, out team had to remove over 20 meters (60 ft) rock above the bonebed layer, which took an entire field season. We started excavation of the site in the summer of 2011, and have collected over 220 bones to date, representing multiple individuals preserved at different growth stages. The recovered bones represent the majority of the skeleton. This makes Wendiceratops one of the best-known early members of the Ceratopsidae. Skeletal reconstruction of Wendiceratops pinhornensis by Danielle Dufault. Wendiceratops was about 7 m (20 ft) long, and weighed between 1 and 2 tons when alive- about the size of a hippo. Wendiceratops is distinguished from other horned dinosaurs by an impressive array of gnarly horns curling forward off the back of its neck shield. It also had a prominent, upright horn over the nose, and may have had large brow horns as well, although we have not found this part of the skull. Wendiceratops means “Wendy’s horned Face”, and it is named after Wendy Sloboda, who discovered the first skull bones of the dinosaur in the remote badlands along the Milk River. Wendy is legendary for her ability to find fossils in Alberta , where she has discovered literally hundreds of important specimens; more than 2000 specimens are attributed to her in the Royal Tyrell Museum of Palaeontology collections. Given her outstanding contributions to our understanding dinosaurs in Alberta, she deserves a dinosaur. Mounted skeleton of Wendiceratops on display at the Royal Ontario Museum, Toronto. Collecting the bones, preparing them, and mounting them for exhibit was a huge effort, and this was documented in the documentary series Dino Hunt Canada, which celebrates the incredible dinosaur fossil record of the country (find out more at http://dinohuntcanada.history.ca/). The Wendiceratops project could not have been done without the help of dozens of university students and volunteers helping out with the dig, hundreds of hours of work by skilled technicians in the lab, and our exhibits team- I can’t thank them enough. 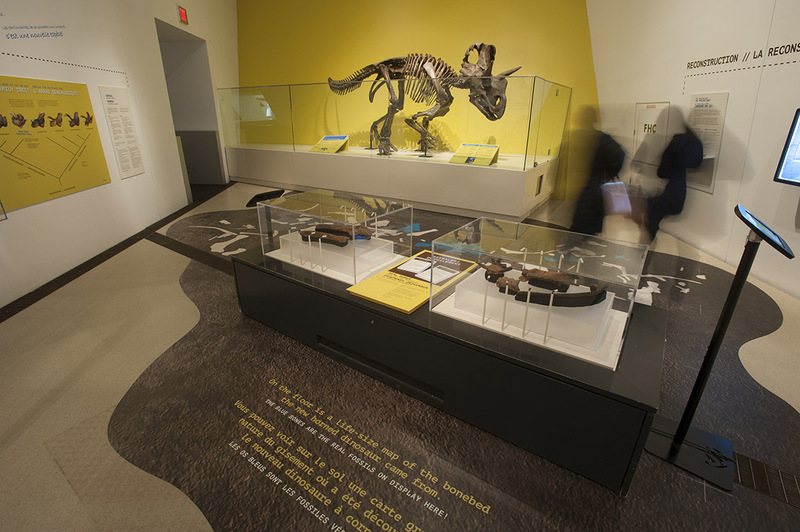 A full size skeleton of Wendiceratops and an exhibit documenting its discovery is currently on display at the Royal Ontario Museum in Toronto. Learn more about Wendiceratops here. Congrats to Dr. Kirstin Brink! Kirstin Brink successfully defended her Ph.D. in the Department of Ecology and Evolutionary Biology at the University of Toronto this past Monday. Here thesis is entitled “Phylogenetics and Dental Evolution in Sphenacodontidae (Synapsida)”. Her thesis explores the importance of dental histology for identifying tooth characters for phylogenetic analyses, as well as understanding feeding ecology changes through time in the oldest terrestrial apex predator, the iconic sail-backed Dimetrodon. ABSTRACT: Paleozoic sphenacodontid synapsids are the oldest known fully terrestrial apex predators, distinguished by strong heterodonty, massive skulls, and well-developed labio-lingually compressed, recurved teeth with mesial and distal cutting edges (carinae). Dimetrodon is an Early Permian (295–272 Ma) sphenacodontid known from southern USA, Canada, and Germany. Dimetrodon is of exceptional importance as it is the most abundant and speciose sphenacodontid, providing valuable information on issues related to the origin of therapsids. Thirteen species of Dimetrodon are currently recognized from hundreds of specimens, but many of these taxa are primarily identified on the basis of size, stratigraphic, and geographic locations. Therefore, little is known about the relationships among species of Dimetrodon or the role they and other sphenacodontids played as apex predators in shaping Early Permian ecosystems. A robust, species-level phylogeny of sphenacodontids will allow for the examination of evolutionary patterns within the clade. The first in-depth description, including histological analyses of several species of Dimetrodon, reveals that the dentition is diverse and bears species-specific morphology. Tooth morphology includes simple carinae with smooth cutting edges and elaborate enamel features, including the first occurrence of cusps and true denticles (ziphodonty) in the fossil record, and the first description of plicidentine in synapsids. The first species-level time calibrated phylogenetic analysis for sphenacodontids, including the enigmatic Bathygnathus borealis, indicates that significant changes within the clade are related to the dental apparatus. This suggests that the morphological changes in sphenacodontids are associated with changes in feeding style and trophic interactions in these ecosystems. The results presented in this thesis are the first steps towards a more comprehensive understanding of evolutionary changes within sphenacodontids and highlights innovations in the group, including the first adaptations towards hypercarnivory. Congrats to Kirstin on completing her degree. 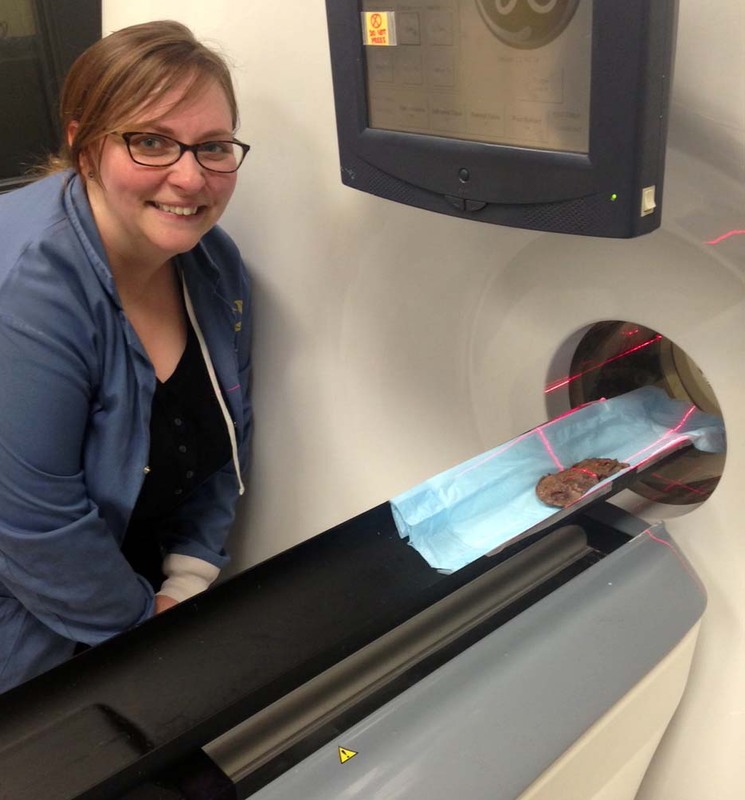 I also want to thank her for her help setting up and running the palaeohistology lab at the ROM. Kirstin is moving on to a prestigious Killam Postdoctoral Fellowship at the University of British Columbia, working with Dr. Joy Richmond, starting in September. Today, Paul Barrett from the Natural History Museum, Nicolas Campione, a lab alumnus and researcher at Uppsala University, and I published a detailed study of the evolution of dinosaurian integument. Despite extensive recent speculation, our analyses suggest that the majority of non-avian dinosaurs were more likely to have scales than to exhibit ‘feather-like’ structures that are the direct precursors to the feathers we see in modern birds. Over the past two decades, a number of spectacularly preserved dinosaur fossils with feathers have revolutionized the field of palaeontology. The presence of feathers in birds and their immediate dinosaurian ancestors – theropods like Velociraptor – is uncontroversial, but the presence of true feather homologues, or protofeathers, in other major groups, such as ornithischian dinosaurs, has been highly debated. Several recent discoveries have suggested that, along with scales, filament-like ‘protofeathers’ might have been present in the common ancestor of all dinosaurs and ubiquitous in the entire group. In order to test the idea that dinosaurs were primitively feathered, we compiled a comprehensive database of dinosaur skin fossils- the most complete to date- and attempted to reconstruct the evolutionary history of dinosaur scales and feathers using a maximum likelihood approach. Most of our analyses provide no support for the appearance of feathers in the majority of non-avian dinosaurs, and although many meat-eating dinosaurs were feathered, the ancestor of all dinosaurs was probably scaly. Interestingly, the quills and filaments in some major plant-eating ornithischian dinosaur groups were evolutionary experiments that were independent of true feather origins. 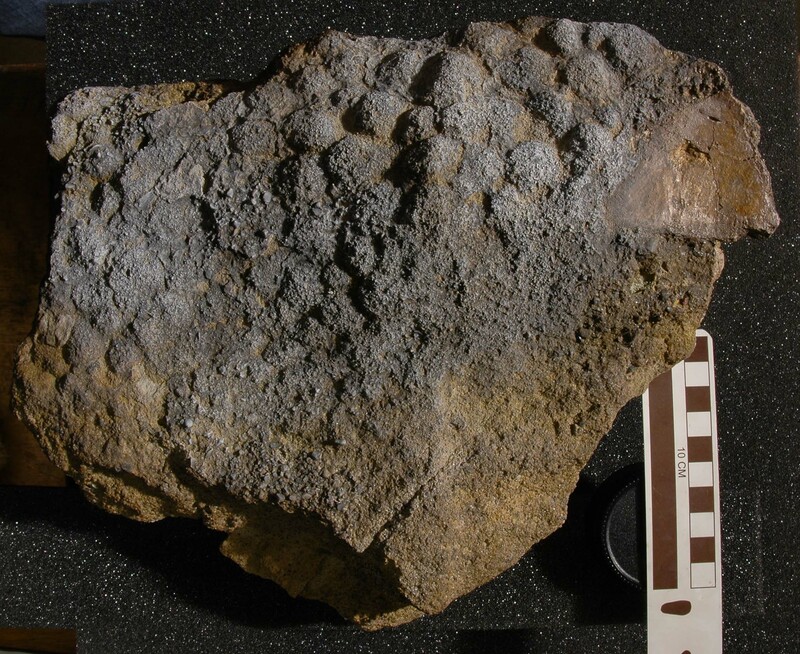 Fossilized impression of the scaly skin of the sauropod dinosaur Barosaurus lentus. Untangling when particular integumentary features first evolved will help us understand the origins of feathers and why they first arose, but our analyses are limited to the data we have at hand and questions still remain. Importantly, our research also quantifies taphonomic biases and identifies gaps in the fossil record of dinosaur skin. The biggest and most significant gap is in the Triassic and Early Jurassic, when dinosaurs first originated and diversified, where very few integument fossils are known. Rocks of this age also lack significant lake/lagoonal fossil sites where delicate feather-like structures are preferentially preserved. This makes the origin of the direct filamentous precursors to feathers difficult to pinpoint. Whether or not the first dinosaurs had true ‘protofeathers’ may only be finally resolved with the discovery of more fossils, particularly from early in dinosaur evolutionary history.